Today, at just about this time, a year ago, Hannah Gracie made a quiet entrance into our lives. 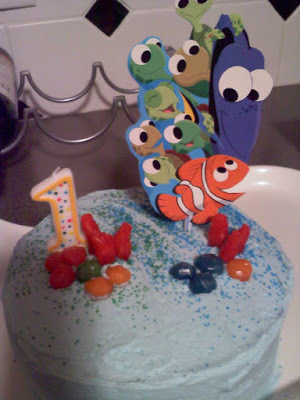 I made a Nemo cake and twenty four cupcakes for the party. I finished them last night at 10:30! I'm so proud. It took me until three in the morning to finish things for Ada's first party and let's just say the cake is something we all laugh at now. Really, not good. Thanks to Wilton's Cake Decorating courses for teaching me a thing or two. So, I tried to get creative with some candy here for the decoration...does it look like a coral reef? Maybe just a little bit? A dozen balloons arrived for the big day, it's party time! After cake, she started opening up all of the great gifts from her family. Pretty soon the room was covered in bright wrapping and tissue paper and a lot of great toys and adorable summer clothes! When everyone left, these two crashed. She stayed up for a minute more to play. And then she hit the hey. And I CLEANED my house. Pre easter warm-up, my parents took us to see the baby chicks and ducks at IFA. Ada couldn't get enough of the eggs on Sunday. She loved her Easter dress, what a beautiful girl. Grandma Holmes's house + Church + Great Grandma's house + Grandma Judd's house = Pooped. Matching outfits, trying to take a picture of these little bugs was way too big of a challenge for my too-slow of a shutter speed camera, apparently. Then, Mark and I at Snowbird in the summer of 2005. Now, my babies and I at Snowbird, 2010. I remember when Mark and I had some random person take this picture of us. Mark didn't want to do it because I had a picture taken here with a previous boyfriend. My haircut, all Mark, he did a great job. I am so glad we took the picture, look at how time has changed me but not the view :) I'm grateful to look at how my family has grown! Really cool. Then, party at our place, this was probably taken in 2006. Now, this is what our parties look like now (most of them anyway). Before kids our bedtime was 3 a.m. and now it's not. At least not every night. Loved our life before kids and I love it now that we have our girls. Then, my pre baby bod. This picture is from Halloween 2007. Now, my post baby body. This picture was taken in 2008. 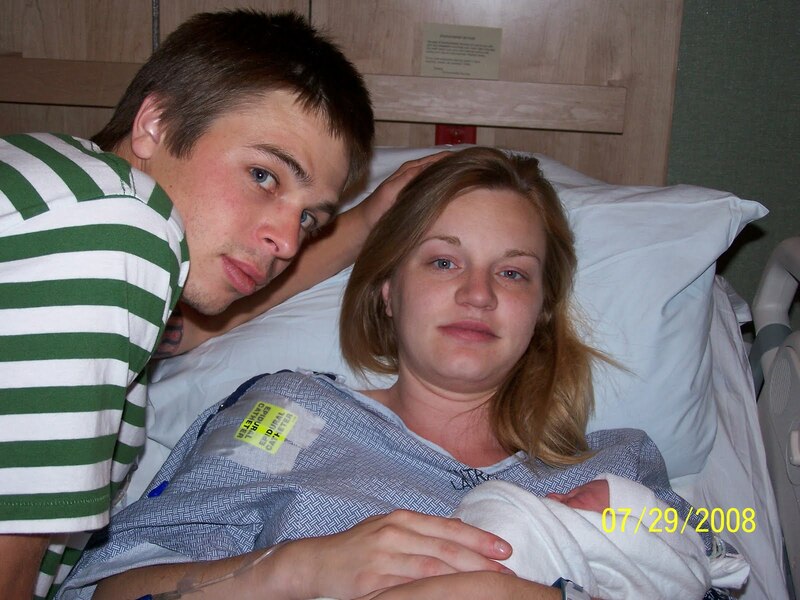 After one kid my body didn't seem to change a WHOLE lot, yeah I am lucky. I have dream pregnancies. After two...not so much. Thank god for Gold's Gym, no joke. Work, work, work. 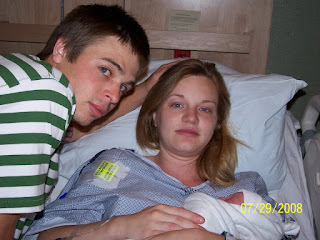 Then, first shot at motherhood, this was taken on Ada's birthday, July 2008. Now, second time around. Hannah's birthday, April 2010. Ada's birth was probably the easiest thing to do but hardest REALIZATION to accept ever ever ever. I did a good job covering up my complete terror in Ada's birth picture. My smile is the real deal however, in Hannah's birth picture. Cute little wooden decals from Hobby Lobby = a little more than 3.00 for the four used above. I spent just over 10 dollars, had a fun time painting the house with Ada and ended the night with at least one BIG smile.